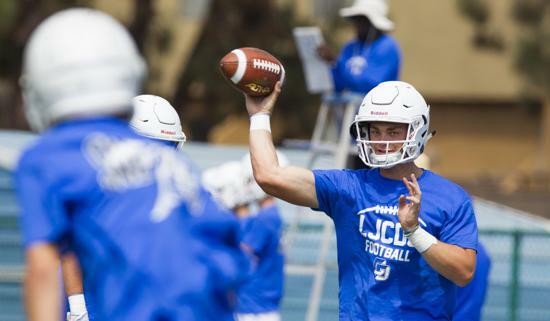 LJCD’s Braxton Burmeister, who has 602 yards passing in two games, will take on La Jolla’s defense Friday night. Burmeister has committed to Arizona. Vista is 0-2 under new coach Dave Bottom, but the Panthers have played San Marcos and San Pasqual tough. RBV is 1-1 under new coach Joe Meyer, losing big to Paloma Valley then edging Westview 7-6. Vista has won eight of the last 12 meetings between these rivals, including 16-10 last season. San Pasqual scored twice in the fourth quarter last week to beat Vista. Ramona gave up 63 points in a Week 1 loss to top-ranked St. Augustine, then dropped a 27-21 decision last week to Point Loma. QB Casey Buggeln is the key to the Bulldogs’ offense. Olympian has run 90 plays in its two games — 67 of those have been rushes. Noah Lacsina leads the ground game with 132 yards on 22 carries. Poway, ranked No. 9 in the San Diego Section, also attacks on the ground with Jared Adelman doing the heavy lifting. QB Niko Perry and RB Kwali Purvis have led Crawford to a 2-0 start. Southwest has thrown just 11 passes in splitting the first two games. RB Zaire Simpson has 281 rushing yards and Leonard Hoar has 166 for the Raiders. No. 2 Helix rebounded from an opening-week loss to Provo (Utah) Timpview, then blanked Concord Clayton Valley, ranked No. 34 in the state, 13-0. QB Carson Baker has thrown for 475 yards. WR Scott Young has 14 catches for 265 yards. Eastlake bounced back from an opening-week loss to Rancho Bernardo with a 41-21 victory over El Toro. QB Alfredo Garcia has 308 yards running and passing. El Capitan opened its season with a 41-14 loss to Mater Dei Catholic. Valley Center lost 35-0 to Mater Dei Catholic in Week 1, then edged Brawley 27-21. Jaguars QB Rikki Mazzetti has thrown for 355 yards while RB Daniel Belcher has 194 yards and Ronnie McCowan has 135. Scripps Ranch QB Jeremy Dotson has thrown for 297 yards, but the Falcons are averaging just 2.4 yards on 53 rushes. University City is led by QB Kees Van Daelen, who has 602 passing yards and six TDs. WR Casey Granfors has 18 receptions and Steven Weiss 15. The team is averaging just 3.3 yards on 55 rushes. Country Day QB Braxton Burmeister has accounted for 767 yards — 602 passing. Jaden Dir has 13 catches and Casey Mariucci 12. La Jolla also likes to throw the ball with QB Cole Dimich accounting for 233 yards. RB Alex Dockery has 160 rushing yards. La Jolla won last year’s meeting between these rivals 52-42. El Cajon Valley has thrown just five passes, relying on Tyson Smith (378 yards) and Maquel Garner (153 yards) to do the damage on the ground. The Braves are averaging 10.3 yards on 61 rushes. Clairemont has scored 93 points in wins over San Gabriel Gabrielino and Francis Parker. Mt. Carmel has allowed just nine points in wins over Otay Ranch and La Costa Canyon. QB Dylan Hunt has 326 total yards — 231 passing. WR T.J. Sullivan has 10 catches for 202 yards. Mira Mesa is off to a tough start, losing to Patrick Henry and Escondido. RB Lamar Raboteau leads the offense with 310 rushing yards. Last week: 10-0. Season: 19-1.